Sunday Victoria (GM) allocation introduced. Sunday Victoria (GM) allocation re-introduced. Extended in Potters Bar from The Avenue to the Station. This timetable shows first and last buses and was current April 1958 - a look at the service interval on Mon-Fri shows that between Victoria and Muswell Hill there was a bus every 3-5 minutes together with Route 24 there must have been a constant flow of buses but as there was no Victoria Line then they were probably needed. Withdrawn between Victoria and Pimlico Mon-Fri except peaks. Sunday withdrawn between Potters Bar Garage and Station. Part Saturday J allocation transferred to Muswell Hill (MH) allocation. Sunday J allocation withdrawn in favour of new 134A allocation. Mon-Fri Part Holloway (J) allocation transferred to Muswell Hill to make room for new 4A and 168 allocation and in turn the 125 was transferred from Muswell Hill (MH) to Finchley (FY). This was part of Stage 12 of the Trolleybus Conversion program. Saturday Holloway (J) allocation withdrawn. Sunday withdrawn between Victoria and Pimlico. Sunday Holloway (J) allocation introduced to compensate for loss of 134A which was withdrawn hence the increased Sunday allocation. Saturday service withdrawn between Victoria and Pimlico. Mon-Fri J allocation withdrawn. Withdrawn between Warren Street and Victoria / Pimlico in connection with the Victoria Line opening. RM2015 is seen at Totteridge & Whetstone Station's car park off Totteridge Lane. The Northern Line platform can just be seen on the left and a signal on the right. Running as MH9 this 134 has just departed Muswell Hill garage and would soon join the morning rush hour traffic down to Warren Street. This was one of two such duties which were scheduled to this point early on weekday mornings before the car park filled up and entry was generally blocked for such a large vehicle. DMSc converted to DM vehicles. Extended from Warren Street to Tottenham Court Road Station. M1385 with the " Pay Conductor " sign. The Colney Lane ultimate was used coming from the Barnet end. Withdrawn between Barnet Church and Potters Bar - replaced by revised 263 service. Withdrawn between Friern Barnet and Barnet Church - replaced by new 234. 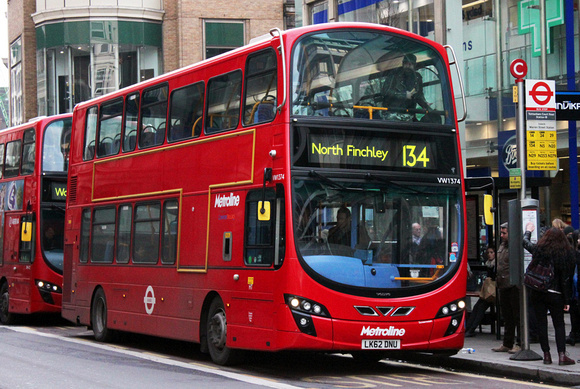 Mon-Sat extended from Friern Barnet to North Finchley via Route 221. Sunday extended from Friern Barnet to North Finchley. Changeover point at Tally Ho Bus Station. Changeover point at Junction Road. Changeover point at Archway Tavern. Changeover point at Wilton Road.